Mirzapur is perhaps the only district in Uttar Pradesh that has more vegetation and wildlife than humans. It is also the only region in the state where you can enjoy your breakfast tea amidst lush green mountains and spend a quiet evening exploring colourful migratory birds nestled in the highest branches of mountain trees. Even though Mirzapur tourism does not come with great food or hotel packages, but it indeed have every qualities needed for a refreshing trip and an enviable chance to get oneself submerged in deep, dark wilderness of wild beasts and faunas. Bhavanipur is symbolic to the true pastoral colours of India. This scenic tribal village is located just 40 kms away from the main city of Mirzapur. The village is also famous for its abundant mineral resources. The best time to visit the place is from October to December. Meja Dam – This dam is located approximately 60 kms away from Mirzapur and is one of the district’s most popular tourist spots. Apart from the large water body, the dam also houses a number of migratory birds such as Siberian cranes. Visit this dam during winters to enjoy the rich and colourful avian life of Mirzapur. Don’t forget to visit the Meja spot which is considered as an ideal location for bird watching. Sirsi Dam – This dam is constructed on Sirsi river and is situated about 45 kms from Mirzapur. Bus services to Sirsi Dam are not very regular; therefore, it is advisable to hire a private cab to the place. Sirsi Dam is formed by 14 Sluice Gates and is a splendid sight during the monsoons when the gates are opened. 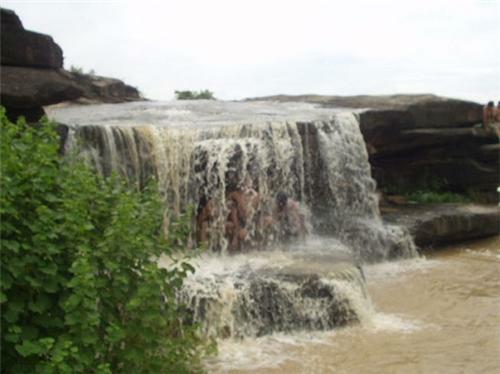 Tanda Falls – It is located 14 km away from the main city of Mirzapur on Tanda Road. Catch National Highway 7 and State Highway 5 to reach the spot. The best time to visit Tanda falls is during rainy season or soon after the rains. The place is always buzzing to tourist and picnic-goers, who visits the place to watch the mesmeric 2400 ft drop water fall. A beautiful reservoir, almost 86-year-old, known as Tanda Dam, is located just opposite the falls. This dam serves as the major water supply source to the entire area. The best way to reach the falls is by hiring a taxi from the city. Sirsi Falls – Just a kilometre away from Sirsi Dam is the Sirsi Falls. This also another major picnic spot for the locals. Hire a cab from the city to visit the place. To get a perfect view of the falls, visit the place during rainy season. Windham falls – This fall is named after the British Collector, Mr. Windham. Apart from the scenic waterfall, there is a spot in the valley that is ideal for bird watching. Along with that, there is also a mini-zoo and a small children’s park constructed by Mirzapur tourism to enhance the beauty of the place. There are two well-known animal sanctuaries in the Mirzapur – Chandraprabha Wildlife Sanctuary and Kaimoor Wildlife Sanctuary. Visit the sanctuaries during the winters to witness rare and endangered species and colourful migratory birds. Sir,I want to know abiut dusri dam.Is it open for public now? Sir,I want to know about sirsi dam.Is it open for public now?